The Aleethia Foundation / An unforgettable night! 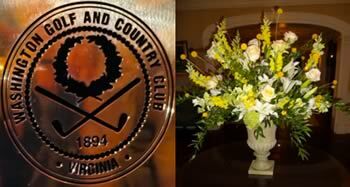 Tillie Smithers graciously sponsored the July 19th “Friday Night Dinner” Mrs. Smithers is the wife of the late Colonel Samuel Smithers, Jr. USA (Ret). Col. Smithers was a member of the West Point Class of 1950 and a Korean and Vietnam War Veteran. 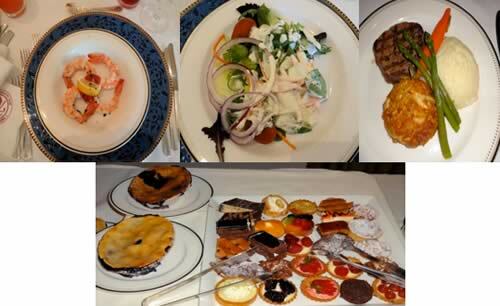 five courses from hors d’oeuvres to dessert! 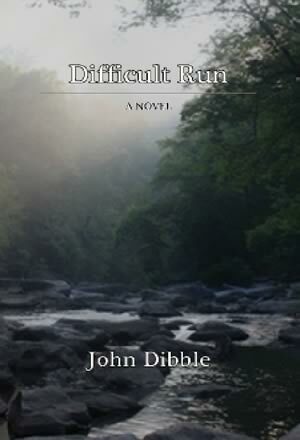 Author John Dibble was on hand to personally autograph his book “Difficult Run” for all the injured service members. John served in the U.S. Navy in Vietnam as officer-in-charge of a Swift Boat, commanding officer of an operating base and advisor to Vietnamese ground and naval forces. 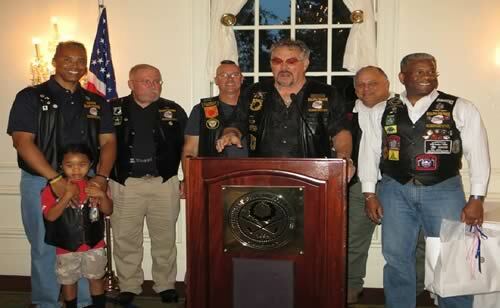 Tillie was made an honorary member of Rolling Thunder Washington DC and Lt Col (Ret) Allen West assisted Tillie with her leather vest. 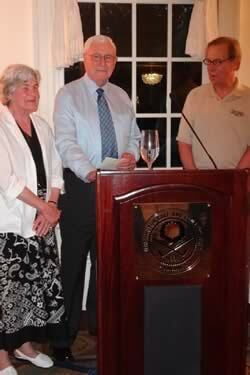 Walt Sides made a presentation of a check to Hal Koster, Executive Director and Tom Maier, Vice President the Aleethia Foundation. 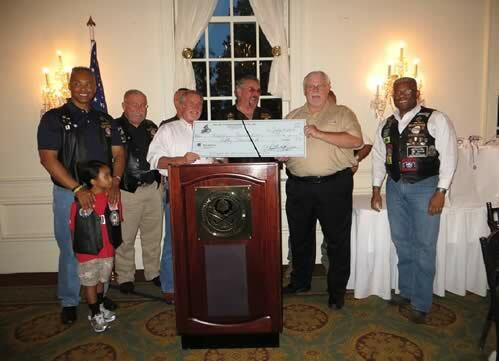 This check represented the proceeds from Rolling Thunder Washington DC Inc.’s raffle of a motorcycle which was held to benefit Aleethia’s programs supporting injured service members. 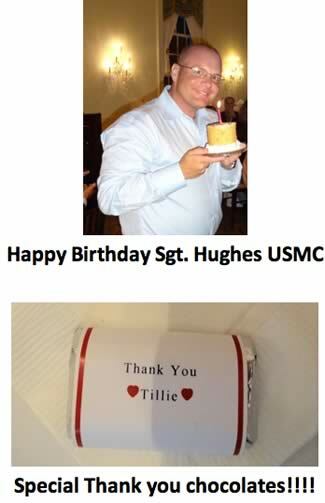 LT. Tom Porter (Korean War Veteran and double amputee) celebrated his 61st Alive Day! Standing with him on the left is his wife of 59 years, Eleanor (a 2nd Lt. with the Women’s Medical Specialist Corps). El was Tom’s former physical therapist whom he met in 1953 at Brooke Army Medical during his recovery. 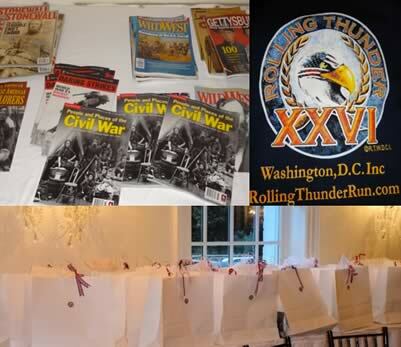 History and Military Magazines provided by Weider History Group; sweatshirts, t-shirts and “jumbo” goodie bags from Rolling Thunder were provided to all the service members in attendance. 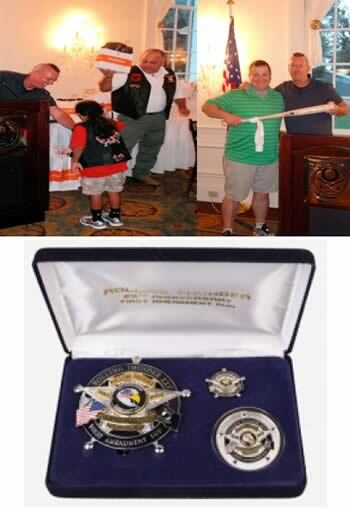 Door Prizes provided by a shopping spree at Brookstone by Norine Fuller included some personal tower fans (a welcomed gift for many) and five lucky winners won autograph sports memorabilia from team members of the Washington Nationals and commemorative 25th Anniversary Rolling Thunder Washington badge, coin and more... Everyone was a winner!